“ My wife and myself are most grateful for the help and assistance you have given us in the sourcing and final acquiring of this plan. If anyone asks how I went about this, I will not have the slightest hesitation of recommending that they get in touch with yourselves. “ Yesterday the lump sum and first monthly payment reached my account and I am very pleased at the outcome of the whole process. I wish to thank you for your fast and efficient service in regard to the matter. and will happily recommend you to any friends who might require help with their affairs. Brexit immediately reduced the 15-year gilt yields from 1.93% just before the EU Referendum to an all time record low of 0.90% on 11 August 2016, after the Bank of England reduced interest rates to 0.25% and announced more quantitative easing buying £60 billion of UK government gilts and £10 billion of corporate bonds. The reason for the fall at the time was uncertainty over the UK economy as a result of Brexit as investors seek safe havens in bonds and gilts driving the price higher and yields lower. Annuity rates are mainly based on these gilt yields and a fall of 103 basis points would usually result in a decrease in annuities by 10.3% at some point from providers. Since Brexit annuity rates have recovered on average by 17.5% with 15-year gilt yields at about 1.5%. Annuity income remains below pre-Brexit rates and it could take several years for gilt yields and annuity rates to improve to higher levels. Using a more flexible retirement plan would allow you to avoid the fallout from Brexit allowing the opportunity for markets to recover with more economic certainty for the future. If you are yet to receive your State pension selecting a term after this date, usually age 65 to 66, would be an ideal time to review your circumstances. It would also give time for Brexit to be implemented and confidence to return to the market. This could include investors selling gilts and bonds and the Bank of England raising interest rates over the next few years. Lifetime annuity rates would also rise possibly by 10% or more. This increase would occur if the 15-year gilt yields returned to a level of 2.5% last reached at the end of 2014. What is a fixed term plan? A fixed term plan is also known as a fixed term annuity, written under drawdown rules and is not an annuity. It is available for anyone over the aged 55 and allows you to take income and keep control of your fund. Whether you are a UK resident, a resident of another country including the United States but have a UK bank account, this plan will give you the opportunity to delay buying a lifetime annuity until a later date. A lifetime annuity provides an income in exchange for your fund and you cannot change this even if your circumstances change in the future. Changes from April 2015 introduced new pension rules allowing the fund to be taken as a cash sum less marginal rate tax. You can take your maximum 25% tax free lump sum and the remainder of the fund sits in a tax efficient pension plan where you can receive a guaranteed fund at the end of the term. You can take any level of income from the plan over a term from 1 year or more. Some providers include a flexible cash account to the plan allowing you to vary the income if your circumstances change in the future. While in the cash account your money remains in the pension and would not be taxed until you decide to take the income. At the end of the term a guaranteed maturity value is available with all your options open at that time such as buying another fixed term annuity, a lifetime annuity or flexi-access drawdown from any provider. There are no investment risks as the underlying assets are invested in gilts and corporate bonds offering a guaranteed return to the end of the term. 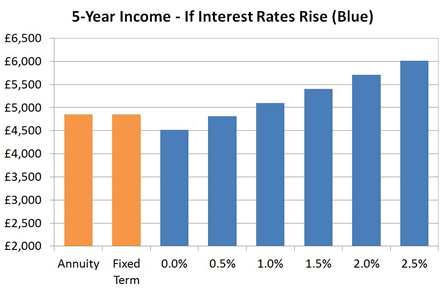 There is no investment risk and the return improves with longer terms of 5 to 10 years which are generally between 2.0% to 2.5% per year. Popular terms are 1, 3, 5 and 10 years although any number of years is possible. Select an income suitable for your needs from £nil up to any amount. Add a flexible cash account to allow you to vary the income if your circumstances change in the future. Take your full fund over two or more years to minimise your tax liability. Offers the flexibility to consider your options again such as a lifetime annuity, fixed term annuity or drawdown. Receive a guaranteed maturity value (GMV) at the end of the term. Move the fund to any provider without charge at the end of the term. Your fund is invested in government gilts and not exposed to investment risk. You can add protection to the plan in the event of early death to ensure it is transferred to your spouse or beneficiaries. Take full fund - Take the maximum income for a number of years with no guaranteed maturity value. Similar annuity income - Match the income from a lifetime annuity for a specific period of time. Specific income - Decide on a specific income you will need over the term you select. £Nil regular income - After taking your tax free cash with no regular income and delay a decision until a later date. By remaining in a pension environment the fund benefits from tax free growth from the maturity value and guaranteed returns of 2.0% to 2.5% per year for longer term plans. Some providers of fixed term plans include a cash account for greater flexibility where you choose to select an income. This will give you the opportunity to reduce the level of income you take should your circumstances change in the future. This could occur if you were working part time, sold a property, cash-in an investment or received an inheritance and did not require the income at that time which can be left in the cash account. As soon as income is paid to you marginal tax would be deducted, however, if placed in the cash account the income remains in a pension without a tax deduction. At a later date you could take part or the full amount remaining in this account and pay marginal rate tax at that time. If you decided to set-up the fixed term plan on a £Nil income basis, it may be useful to take an income and place this in the cash account to give you the flexibility to access funds during the fixed term if needed. The fixed term plan is designed to provide an income over a term selected by you. As an example, a 60 year with a fund of £133,333.34 could take a tax free lump sum now leaving £100,000 for a fixed term plan. The income from a lifetime annuity on a 100% joint life, monthly advance and level basis is £3,640 pa. The fixed term plan can also match this amount with a guaranteed maturity value at the end of the of terms from one to ten years. The longer the time period the better is the return. Source: Sharingpensions.co.uk research for a 60 year old with a fund of £100,000 on a 100% joint life and monthly in advance. Shows the combined GMV at the end of the term and income of £3,640 pa paid over different terms. Income from the fixed term plan can be taken from £Nil to any upper amount and in the example is compared to a lifetime annuity of £3,640 pa based on a 100% joint life payable monthly in advance. For the fixed term annuity, the total return varies and improves with longer terms from 5.0% over five years, 9.0% over ten years to 17.3% over fifteen years. Over a five year term the total value would reach £105,061 and pay total income from this of £18,200 leaving a residual fund of £86,861. A fixed term plan allows a 60 year old with a fund of £100,000 an income from £Nil to any any maximum payable over a term from one year or more. The Bank of England expects interest rates to rise by a further 2.0% to 2.5% in the next 5 years and this would result in a rise in annuity rates. For a 60 year old with a fund of £100,000 a lifetime annuity on a 100% joint life, monthly advance and level basis pays an income of £4,850 pa.
As an example, this income of £4,850 pa is matched by the fixed term plan over a 5-year term and the following chart shows the effect of a rise in interest rates of between 0.0% to 2.5% in five years time if you then buy a standard annuity. 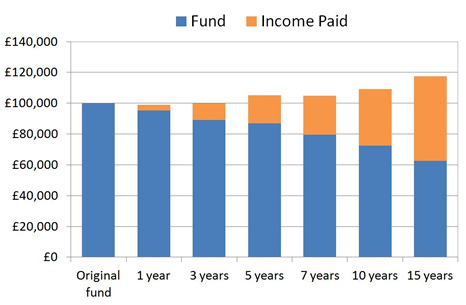 Source: Sharingpensions.co.uk research for a 60 year old with an income of £4,850 pa for 5 years. This is followed by an annuity based on interest rate rises by this time from 0.0% to 2.5%. For the fixed tern plan if you select an income of £4,850 pa you will receive a guaranteed maturity amount (GMA) of £86,210 at the end of the term. If interest rates increase by a further 1.0% in the next five years the standard annuity would be £5,102 pa. If interest rates rise by a further 2.5% at the upper end of the bank of England's range in the next five years the standard annuity would be £6,018 pa. If you wanted the income from the plan to continue for a fixed period of time you can add a guaranteed period for up to the full term. Income would be paid to your nominated beneficiary or your estate although at the end of the term there would be no guaranteed maturity value. You can also protect a spouse with a 100% joint life benefit. On early death the income will be paid for the term selected and at the end of the term the guaranteed maturity value will be available. A lower percentage could also be selected, such as 50% joint life, in which case half the income and half the maturity value would be paid. The spouse will then have the choice of taking another fixed term plan, lifetime annuity from any provider, flexi-access drawdown or any other pension arrangement available at that time. If the fixed term annuity is for a single life you could add 100% value protection. In the event of early death the original fund less income paid to date would be paid to date will be paid to your spouse or returned to your estate if you are single where it can be paid to your children. Once the tax free lump sum is taken, all cash sums removed from a pension plan are subjected to personal taxation. If you are born after 6 April 1948, the first £10,000 of income is the personal allowance and this is not taxed, the next £31,865 is at basic rate tax of 20% and thereafter higher rate tax at 40% applies. To avoid paying higher rate tax the fund would need to be extracted over a number of tax years. For the fixed term plan you need to know at the start the level of income you need for the term of the plan. If you received other income in the future this may result in part of your income exceeding the basic rate tax limit. Suitable if your fund is £20,000 or more after tax free cash. There are many options you can select and the strategies are a guide to show the possibilities for income and capital. The fixed term quote is written under drawdown rules and you will be able to review your options again in the future.